The chaplaincy is an incredible opportunity to present and represent the claims of Christ, but it is not a calling for the faint hearted. Carrying forward spiritual battle in the midst of physical battle is an extreme challenge. What’s your biggest challenge? In many ways, the biggest challenge is similar to that faced by all Christians everywhere: staying Christ-centered, gospel-driven, and godly in response to the many demands and pressures that come upon us. 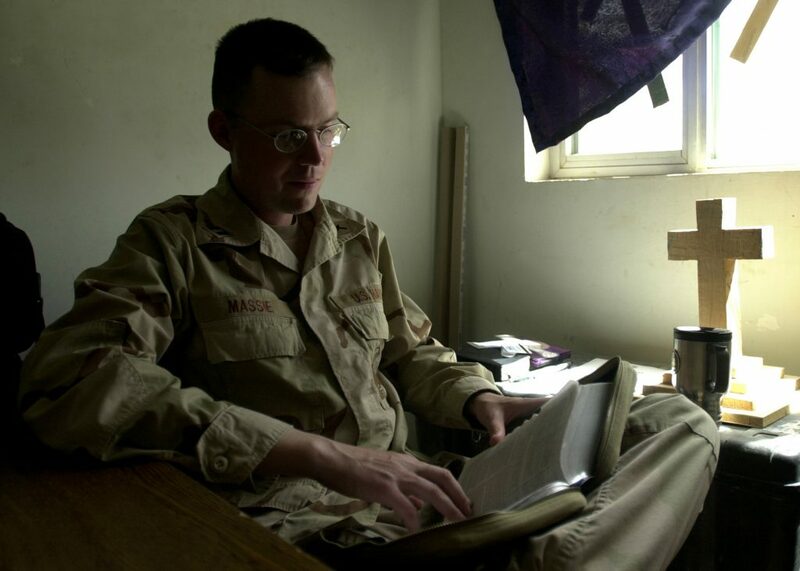 It’s easy for any Christian military person to become distracted by staff and circumstantial demands in the midst of the heavy and demanding burden imposed by combat operations. Both taking initiative and responding in the great variety of situations imposed by war-fighting is challenging to begin with, doing it in a godly fashion takes constant reliance upon prayer, the encouragement of Scripture, and the ministry of the Holy Spirit in our lives. Do my words and actions reflect the fruit of the Holy Spirit? That is the test. When they do not, do I have the honesty and transparency to repent, confess my sins to God and man, and continue to move forward? That is our calling in Christ. Tell us just one thing about the chaplaincy? You need to endure all manner of tedious activities in order to gain the privilege to be heard by those to whom you are called to take the Good News. How do you deal with the information you hear? I pray moment by moment. When I sense I am weakening, I pray. When I sense I am not living by the power of the Holy Spirit (as indicated by the fruit of the Holy Spirit in Galatians 5:22-23) I turn to Scripture for everything it promises to give me, which is everything needed for life and godliness (2 Peter 1:3). I seek the fellowship and counsel and prayer of other believers. I remember that God has permitted me years of training–spiritual, physical, and professional. He has placed me where I am for such a time as this “according to the plan of Him who works out everything in conformity with the purpose of His will” (Ephesians 1:11). It’s not an accident I am here right now (deployed). I rejoice with those who rejoice; and I mourn with those who mourn (Romans 12:15). Proverbs tells us that God makes the righteous as bold as a lion. I am righteous in Christ, so I am called to be bold for Him. What can OCF members do to support chaplains? Pray the prayers of Colossians 1:9-12, and Ephesians 1:15-19, and especially Ephesians 6:19-20. Whenever you are gathered with other believers for study and prayer, remember the chaplains you know by name. Now is certainly a time that God is testing His people in the United States, to see whether we will be faithful and fervent. As we never forget that we are at spiritual war in this life, even while we are at peace with God (Romans 5:1), so may we not forget that we are at physical war. It’s a long war that will not soon go away. Only God’s strength will be great enough to carry us through both conflicts. What advice would you give to a young person going to war? Become a Christian and seek to actively live your life for Christ. Learn and exercise Christian spiritual disciplines with rigor and zeal: be committed to corporate worship, reading/studying your Bible and memorizing passages, fellowshipping with other believers, corporate and individual prayer, and sharing Christ with others. And most important in the midst of this mindset: get a grip on God’s grace and what that means so you don’t become self-righteous as you live for the Savior. Get physically fit, get mentally fit. Remind yourself that you are going to war, which is a form of controlled and channeled violence under authority. The enemy will physically kill you if he has the opportunity; the enemy of your soul will destroy you as well if given the opportunity. If you are in the military, God calls you to be nothing short of a warrior. Prepare yourself mentally for what war is all about. This current conflict promises to be a long one and a violent one. Biblical fitness will sustain you. Any thoughts for someone being deployed—again? Focus on praising God for the positive opportunities He is going to give you again. Get on your knees and pray, thanking God for what we have in this country. Thank God that you are able to defend yourself and others. Pray that God would penetrate the land to which He is sending you with His glorious and powerful good news. If that doesn’t eventually occur, any physical victory is of no long term benefit. If you are married with a family, get some great family photos taken by a professional photographer. Read a daily devotional together/simultaneously with your family members. Write often—or at least as often as possible. If you’re not good with words, this is your opportunity to improve. Some words are better than none. For men, get accountable with others in order to avoid the scourge of pornographic material or it will destroy you. Work on a project for the Lord while deployed/separated. Focus on how you can serve Him today. What advice would you give to their families? Don’t give in to grumbling and complaining. It is a spiritual cancer that will distract you from thankfulness and praise. We are at war, spiritually and physically. Service members have lost their lives, and families have lost their loved ones for spiritual and political freedom. Others are completing third and fourth deployments. It’s been a long time since we had to pay any substantial price for what we have come to take for granted as a nation and as the church of Christ. Get on your knees and pray, thanking God for what we do have. What advice would you give to someone considering the chaplaincy? Confirm your calling to ministry in the local church. You may think you are called, but the internal call is only half the equation. Is it confirmed by God’s people as they observe your life within the body of Christ? Read and study the Bible. Let the Holy Spirit lead you to a high view of Scripture.